Whether you are planning a formal reception or a casual seaside ceremony, there are so many reasons why The Liberté is your perfect venue for your wedding day! Choosing a special wedding venue for your wedding day is one of the most challenging decisions you will make in your planning process. As you are planning your wedding for 2019, it is essential to choose a location that suits your style, satisfies your needs, and provides a comfortable space for you and your guests to enjoy your big day. In addition to being the location of your wedding, your venue will also be the backdrop for all of your beautiful wedding photographs throughout the day and evening. Whether you are planning a formal reception or a casual seaside ceremony, there are so many reasons why The Liberté is your perfect venue for your wedding day! What better place to enjoy your wedding in an intimate setting than to have a private wedding charter as your venue? Imagine saying your vows on the sea, surrounded by your family and closest friends. With a breezy summer or early fall day, your private wedding charter will be the perfect intimate setting for your wedding. Whereas other wedding venues may only offer one photogenic spot for photographs, a private wedding charter provides a more scenic backdrop right on the water. 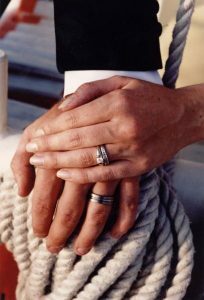 Say “I do” on the Chesapeake Bay in Annapolis or along the picturesque coastal seaside of Cape Cod. With a beautiful sunset on your perfect day, The Liberté will undoubtedly provide you with stunning photo opportunities for your wedding photos that you can cherish forever. Several couples spend a significant amount of time deciding on a perfect wedding theme that represents their style and interests as a couple. With a private wedding charter aboard The Liberté as your venue, you can easily complement the look of your venue with an elegant, nautical theme. From beautiful seaside invitations to a fun, nautical guest book, your theme will perfectly tie your wedding together with your ceremony and reception space. Many of your guests have already attended their fair share of weddings. Have any of your guests attended a reception on a private wedding charter? Let your special day aboard The Liberté be a fun and unique experience for both you and your guests! This entry was posted on Friday, February 1st, 2019 at 12:08 pm. Both comments and pings are currently closed.